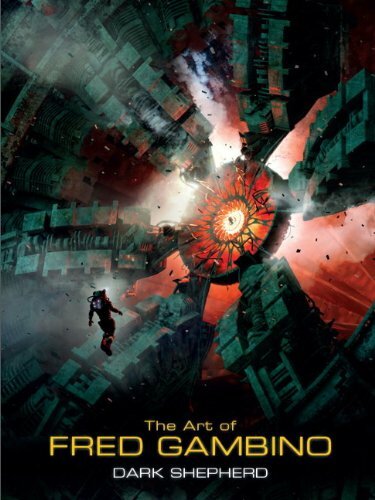 Dark Shepard is a large 160-page hardcover artbook that features predominantly the sci-fi artworks of Fred Gambino. Gambino started out working in traditional illustration, but now creates mostly digital art. His style, at least in this book, is that of blending 3D renders, photography and digital art. Dark Shepard is actually a sci-fi genre screenplay written by Gambino. The first portion of the book is devoted to fleshing out that screenplay with accompanying artworks. There are few pages of dialogue for the characters created and then it's followed by artworks of space travel and exploration, with adventures like a spaceship escaping the jaws of a giant alien serpent, exploding moons falling from the sky, scenes of colourful nebulas. After that are behind the scenes concepts to Dark Shepard, such as photos of the human models, armour rendering, 3D models of mechs and spaceships. Dark Shepard also appears in comic form for a few pages. The rest of the book collects the commissioned artworks he created for book covers, and the concept art for film, tv and games. He has worked on the Battletech and Mechwarrior book covers, created the landscapes for Escape from Planet Earth, Cartoon Network's Firebreather and has many other sci-fi tech-heavy commissioned artworks as well. The concepts presented, such as the robots and spaceships, are nice but could be stronger in terms of being more distinct. I prefer the environment art. Much of what's in the book have the look and feel of computer generated visuals because of how the textures, modelling and lighting are handled. The mixed media artworks may not be jarring but one look you will know that it's mixed media, especially for the artworks that are created with photographs and 3D models. That's the style of Gambino and it works well for the book covers and for other work he does. Having said that, I would recommend looking through the pages before buying to see if that's the kind of style that appeals to you.